Why Has My Sweater Got Three Arms? I haven’t tried every craft but there have been a few. The first was knitting. Despite the title I was quite good at it if you don’t count those round needles. I never could get the hang of them. My Mother used to knit so I learned. I used to start with enthusiasm, I finished with relief but the bit in the middle was a bit of a bore. It went on for ever. Then I tried crochet. I made myself a beret. It went very well until I tried it on. It fell over my eyes; tension was obviously not my thing. It was a rather fetching shade of luminous pink. It would probably be back in fashion as ‘retro’ now. After that I tried cross stitch. I rather liked that as long as I could watch a video at the same time. Now I listen to audio books but in those days they weren’t really around. I did quite a lot of cross stitch but what do you do with it when you have finished. I don’t really want embroideries all over my walls. I even had some designs published in a magazine. That just meant that I spent hours stitching for a very small reward. 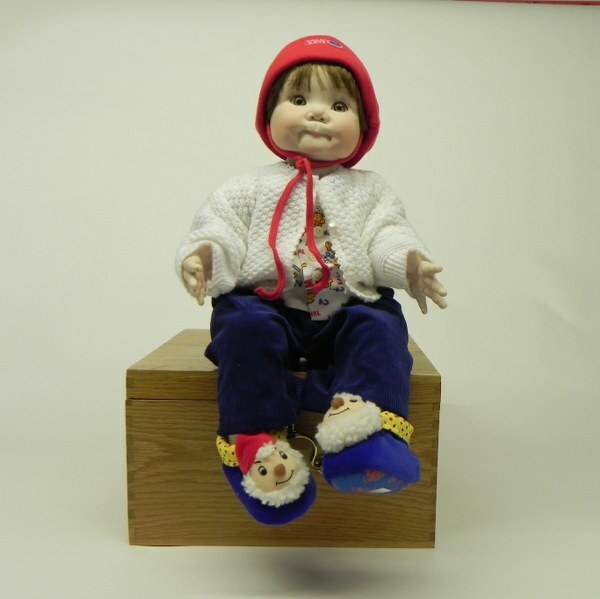 Mind you it did come in handy for small carpets and rugs in my dolls house stage – more of which in a future post. 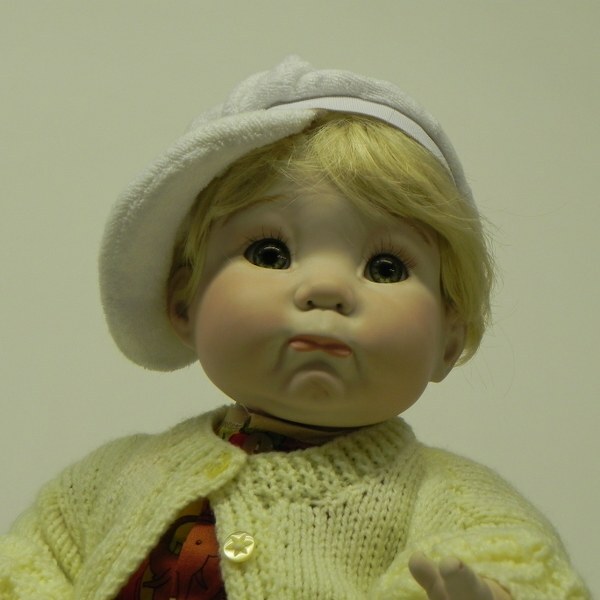 Eventually I discovered dolls, porcelain dolls. I enjoyed every stage of making them. Pouring the slip, firing, painting, making bodies and dressing them. They really are rewarding to make. Unfortunately I’m not sure I could even lift the moulds these days. They are very, very heavy. These dolls are small but very detailed and dressing them can be a challenge but they are lovely when finished. Here are a couple of slightly different ones. I have packed all my dollmaking equipment away to make room for the quilting equipment but I still have lots of dolls to finish if the mood should take me. 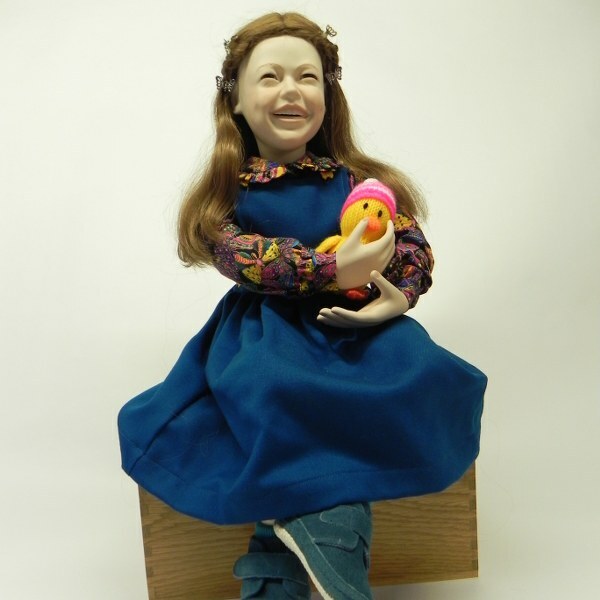 If you have never made a porcelain doll and I am sure most of you haven’t, then you will not realise just what that means. I have shelves and shelves of moulds and soft-fired greenware. I have two kilns and bottles and bottles of slip. there are enough ribbons to stock a haberdashery and enough baby shoes to open a shoe shop. Add a filing cabinet full of dress patterns , sundry cots, prams, chairs and goodness only knows what and that is a lot of space. It’s the equivalent of a very large stash. I did think ahead and buy myself a Horn cabinet so that I can always fold it away if I need to and my pouring table is temporarily a cutting table so that I can do more if I so desire. Like quilting it can be an addictive pastime if a bit messier. 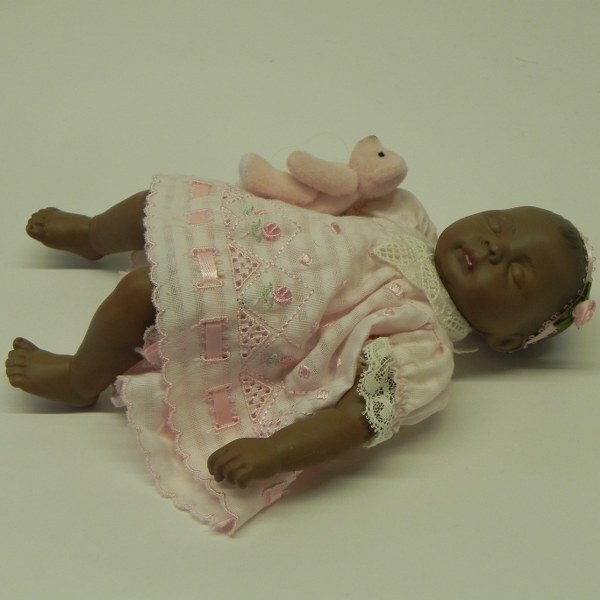 I have some more of the baby dolls on my site if you would like to see them. 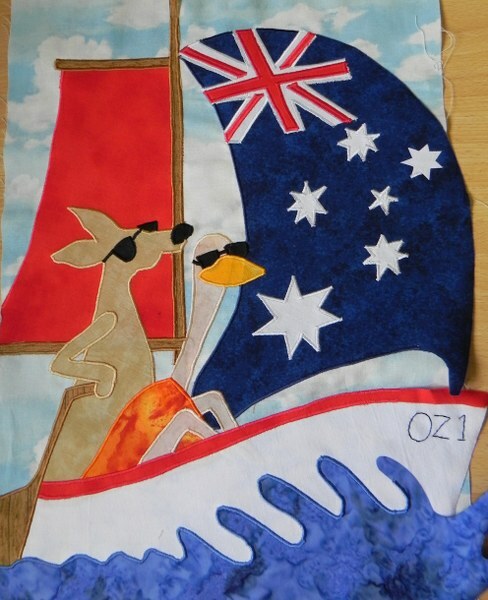 This has been a diversion from the quilting but I have almost finished the quilt top started in ‘Roos’ Damned Roos and Wallabies’. I will post a picture soon. Unfortunately I now have to quilt it. This could be a little delayed as the wadding I like is out of stock and has been for a while. I like my quilts to be ‘puffy’ as daughter number two always says. I like them to be warm rather than just decorative. This could have something to do with the fact I live in a draughty old listed building in the Northern Hemisphere. It could of course just be that I like ‘puffy’ quilts. I started designing quilts partly because I couldn’t buy patterns in the places I lived but also because I wanted more of an input into how the quilt turned out. It took me some time to master the mechanics of piecing, applique and quilting and I made up lots of other people’s patterns but I wanted to do my own. Part of it was that I was going to make quilts to sell and that is not acceptable to many designers, although some do now allow it. 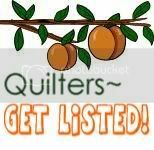 I soon discovered that I don’t really like the actual quilting bit enough to complete projects to sell and that even if I did the man hours are such that the price would have to be prohibitive. One of the groups of designs I have done includes the cowboy one you may have seen in an earlier post and I call it the ‘Jamie Plays…….’ collection. Each shows Jamie in a different occupaion. There are several in the pipeline but there is one more available in a pattern already. 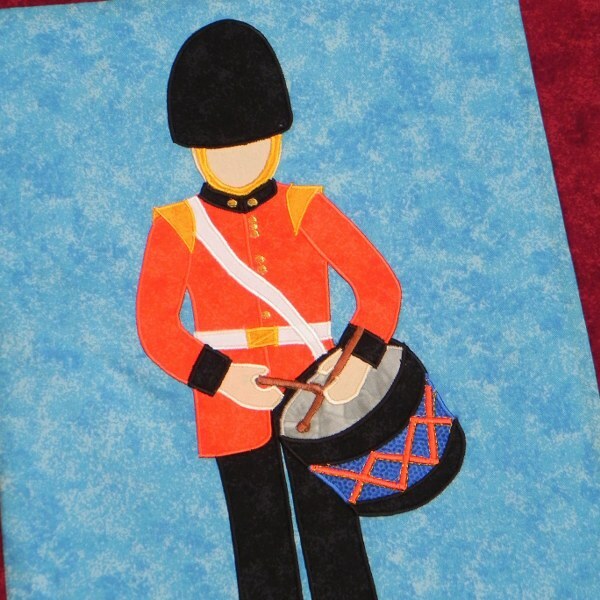 This is the ‘Jamie Plays Soldiers’ pattern that is also available in a kit. 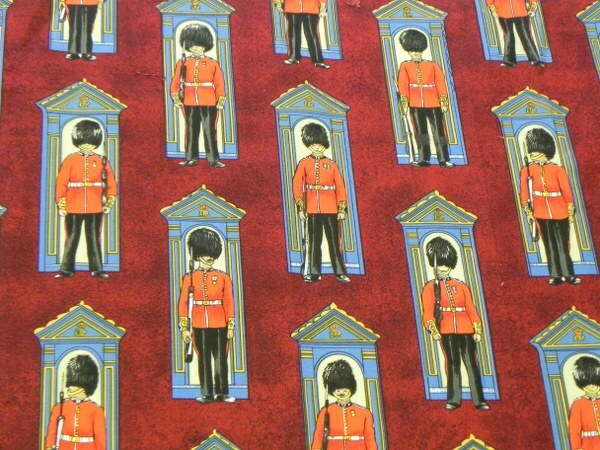 I even found a soldier fabric to match from Nutex in New Zealand. Sometimes just finding that perfect fabric makes all the differece between OK and perfect. I matched the rest of the quilt to the border. When I lived overseas I used to take a pile of fat quarters out after every leave and I made everything from what I had. Now I have the whole range of makower Spraytime on my site so it was quite easy to find a match. Although strangely because I have every colour It is often more difficult than when I had to work with what I had. It gave my work a bit of a signature if you know what I mean. 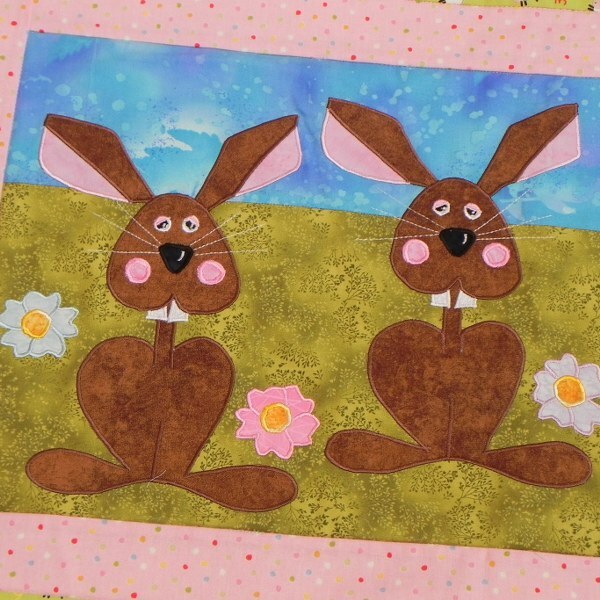 As you will have seen if you look at comments – I have had some questions on technique with machine applique. As I explained in my replies, I have largely developed my own way of doing things but helped along the way by tips picked up from various places. I can only tell you what I do, others may have other methods but as long as the end result is what you want that is all that matters. I use either Madeira or Gutermann Sulky embroidery threads for my applique. I have the full range of both makes because I did a trade with the B.C. – he got a boat and I got an industrial embroidery machine. I then bought both ranges. When I started buying embroidery patterns I found that most of the ones I wanted were digitised for Madeira threads. As a result I save them for my embroidery machine and I use the Sulky thread for the appliques. I know these are available in UK and Australia and they are both suitable for machine applique. This does not mean that you can’t use any other. I personally think that if I am going to spend time and money on making a quilt I don’t want to risk spoiling it with a cheap thread that may not sew properly or might run when the quilt is washed. That is not to say that you can’t use cheaper thread. All I am saying is that as with all other aspects of machine applique, in fact, quilting in general, ‘try before you buy.’ Try it, if it works, use it. I am sure there are lots of other threads of the same quality as Madeira and Sulky too, all I am saying is that they are the ones I know I can get here and that work well. I also use a stabiliser on the back of each block. Again, you don’t have to, I have had to do without many times as I couldn’t buy it where I lived. I find it helps the fabric to move more smoothly and creates a better stitch on top. As it helps the fabric move it also helps prevent it sticking in one place and making the machine form knots of thread which are a pain to have to sort out. I bought my original Madeira threads from Barnyarns in the UK and every so often they send an email out with a little tip on how to get the best from their products or why you might be having problems. In one of these mention was made of the fact that the top tension should always be no higher than 3 when embroidering. This of course means that the top tension is looser so it doesn’t pull the bobbin thread up to show on top. 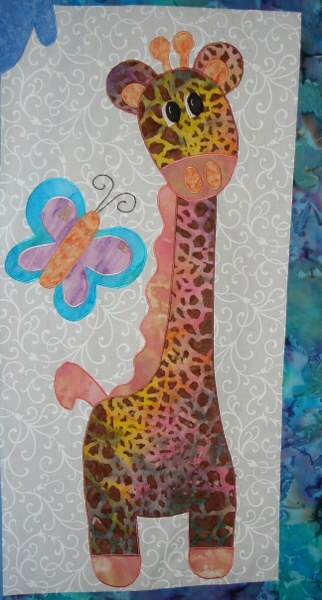 Again, experiment – never start a new process on your quilt until you have perfected it on a piece of scrap fabric. Try the tension at 3 and reduce or increase until you get a smooth satin stitch on top and stilll have some of the bobbin thread showing underneath. If there isn’t any then you have probably got it a bit loose. I use an open -toed applique foot but all that is really required is that you can see what you are trying to sew. 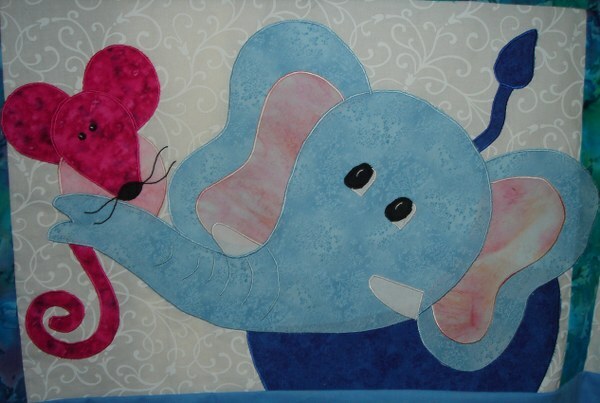 You need to follow the outline of the applique enclosing the edge of it in the satin stitch. You don’t have to use satin stitch but if you don’t and use a zigzag or other stitch it may fray in the wash. 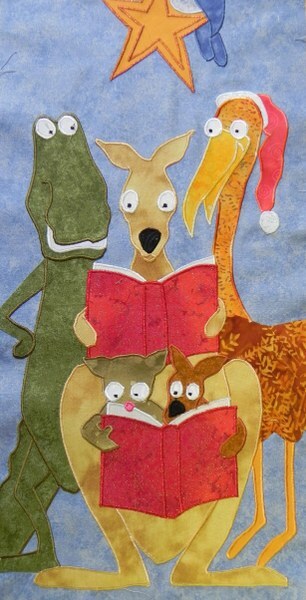 I also find it easier to stitch with the applique on the left – but I am right handed. I bought special embroidery needles at great expense and discovered that all that happened is that I broke them quickly. I think it is probably that, as they have made the eye longer to reduce friction on the thread it weakens the needle and so any little bit of strain or bending in stitching results in snapping. Again, this is just my experience, you may find they help a lot. I just use my ordinary machine needles and it doesn’t seem to matter what size either. As you will have picked up if you have read the earlier posts, I use fusible webbing to fix the appliques to the background. I am repeating myself a bit here but not everyone reads all the back posts or can necessarily find the right one. I have tried a few and I find that the Heat n’ Bond suits me best. Some of the webbings come away from the backing paper before you have time to trace the smaller pieces and this tends to result in a sticky iron or board as you try to retrieve the situation. 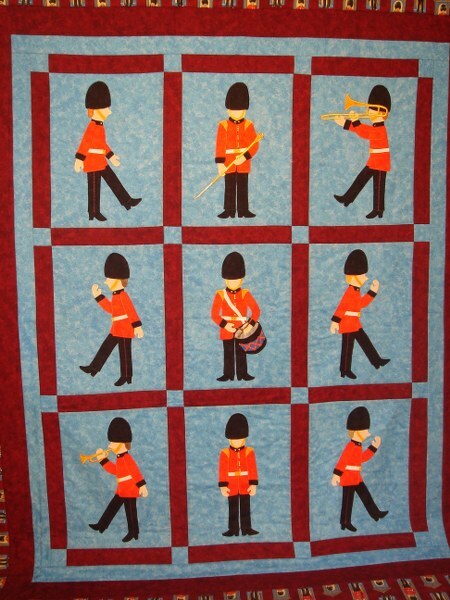 When I made the Gollyville quilt they supplied one which was equally good. They are based in Australia and if you go on their site it appears to be called ‘Applifix’. I am sure there are others depending on where you live. Fusible webbing is basically a sheet of dry glue with paper on one side. You take reversed pattern pieces and trace them onto the paper side. You then cut the shape out roughly, iron it onto the back of the fabric you are using for that piece, allow it to cool and then cut out accurately round the traced shape. You then remove the paper and what you have is your applique shape the right way round and backed with glue. You then have two choices. 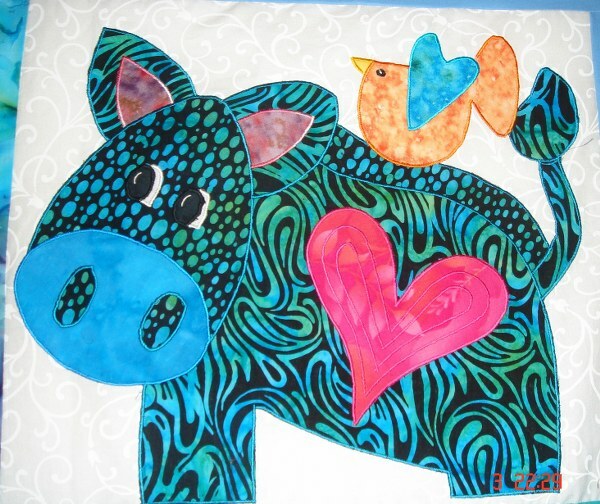 If it is a simple applique like a heart you might just lay it onto the background fabric and iron it on. Then you stitch as above. If more complicated you might want to use a template (see below). Put the template on the ironing board. Place a piece of non wax baking paper (greaseproof paper in UK) over it. I used a cheap one and found it wasn’t successful as the pieces stuck so that’s a tip for you. It usually has a slightly shiny surface to stop things sticking. Place all the pieces in turn onto the greaseproof over the template and ‘tack’ them into place with the point of the iron. When you are satisfied with the whole place another piece of greaseproof over the top and press quickly. 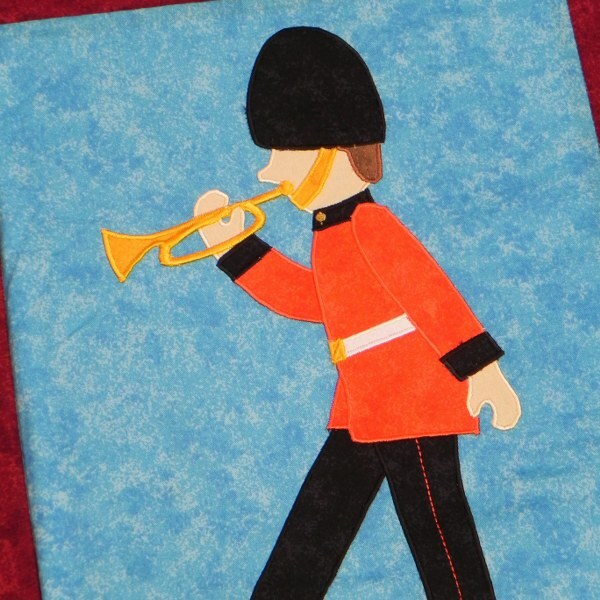 Allow to cool then remove the whole applique from the paper and place onto the background. 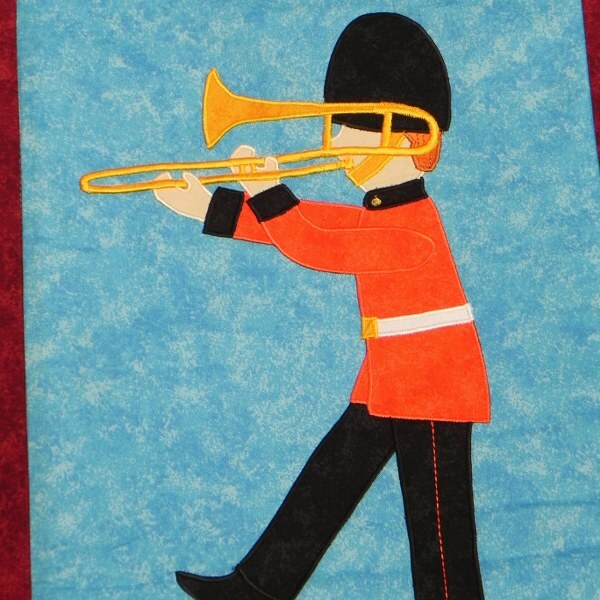 You can buy an applique sheet but I don’t get on with them It doesn’t mean you won’t though. Using a steam iron, fix onto the background. This works well with the fusible webbing I use, you might like to experiment with scrap before risking your expensive fabrics, especially if you are using a kit. I had better stop rambling now as I think that’s probably enough for anybody to read. If you have any questions don’t hesitate to ask. I am happy to think I can help . You might have some tips or favourite brands in other countries too. But Where are the Fish? ‘Curiouser and curiouser’ as Alice said when her feet disappeared from sight as her head shot into the stratosphere. Apart from a near miss, with a skillful skid, on a patch of whey, in my shiny bottomed crocs, my feet have not exactly disappeared. However we are now the proud owners of a fish tank heater. No we do not have any fish, we have cheese. Yes, I said cheese, the blessed stuff is taking over our lives. Daughter number two and I spent a portion of this afternoon searching for the fish heater. We found a very impressive pet shop. Not having any pets I haven’t been in a pet shop for donkey’s years. I seem to remember they didn’t smell very nice. I suppose the correct word if we are to believe Dr Johnson is actually stink as, not having noses pet shops can’t smell but boy did they stink. Anyway, this one was a bit like a pharmacy. I was very impressed. I presume there must be ventilation in the cages as there was only a vague aroma of mouse flavoured straw wafting through the air. I think one of the problems is that up to the age of ten I lived in a house which regularly housed field mice. I seem to remember that on at least one occasion they took up residence behind the stove. (I often felt like that myself in the Winter). Mice behind the stove are not very nice. If memory serves they were fairly permanent but a combination of childhood memories and the fact my brain doesn’t work as well as it used to probably means it only happened once. They probably left in a hurry when my navy blue school knickers, put in the gas stove to warm in the winter, spontaneously combusted. It’s enough to make anybody leave home. Enough of that, back to the fish tank heater. Apparently when you make gruyere in particlar you have to keep it in a humid atmosphere. Having spent years and money finding solutions to keep the cellars dry I did not take kindly to the suggestion that we bring in a humidifier and heater and make the corridor between the cheese cellar and the fabric cellar resemble a turkish bath. Compromise prevailed and we now have the cheese storage shelves surrounded in black sacks and a bowl of water with a fish tank heater. Who said your brain goes as you get older. Go on like this and we will slow down patent office business big time. I would post a picture but one black sack is much the same as another. On an entirely different subject and back to applique. I expect that many of those who have looked at my blog and appliques such as the cowboys will think that it must be difficult to do machine satin stitch on small pieces. Bear in mind that the ones on my patterns are usually done on individual blocks. My friend bought one of the kits from Gollyville in Australia. (You really must click this link. It is amazing.) She took one look at it and realised it was a lifetime’s task. I thought the same but eventually I offered to do it (probably thought it would help me live for ever) and I must say it was one of the most enjoyable appliques I have done. Unfortunately I refuse to hand applique, life is too short and my head too full of ideas- although I admire those who do. The quilt had to be done on a single bed sized piece of fabric. Trying to manoeuvre that on a machine round small pieces is no picnic but actually I was surprised – it wasn’t as difficult as I thought it would be. The biggest problem with it was that, as I had done so much applique over the years the zig zag mechanism was on its way out so some of the satin stitch was a pretty scalloped edge rather than the smooth finish it should have been. When I took the machine to be serviced the engineer wanted to know what an earth I had been doing to wear it out. He wouldn’t understand so I didn’t go into details. I was sad to lose the machine though as it had been a friend over many years. The point I am making is that you shouldn’t just look at complicated looking appliques. Have a go, you might be surprised. 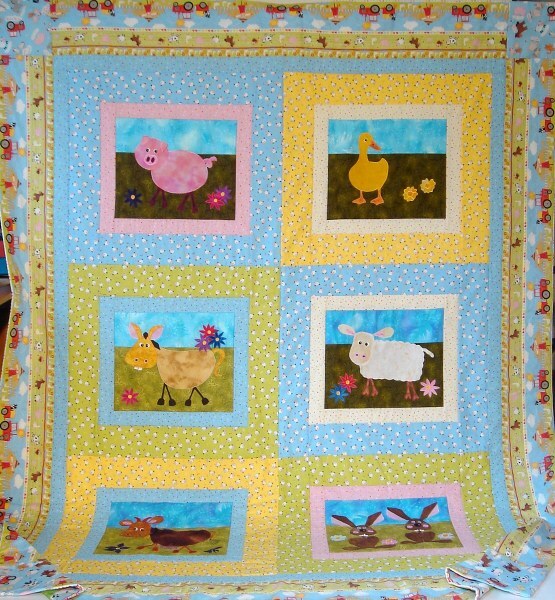 To summarise from the blogs posted so far if you are thinking of applique perhaps you could start with something like the cot quilt featured in an earlier blog followed by something more complicated such as the farm wallhangings or quilt. Then go on to something more complicated as the pieces are smaller such as the cowboys and when you have mastered that the Gollyville should be a doddle and after that the sky’s the limit. As I keep repeating, the pace is the secret – only do what you are confident of being able to do but also do not do something you are going to get bored with and therefore not finish. Then we are into the realms of U.F.Os and there lie years of guilt and wasted opportunity. You really don’t want to start down that track. I have just realised that I haven’t included any photographs which, this far down the blog is a bit remiss of me. 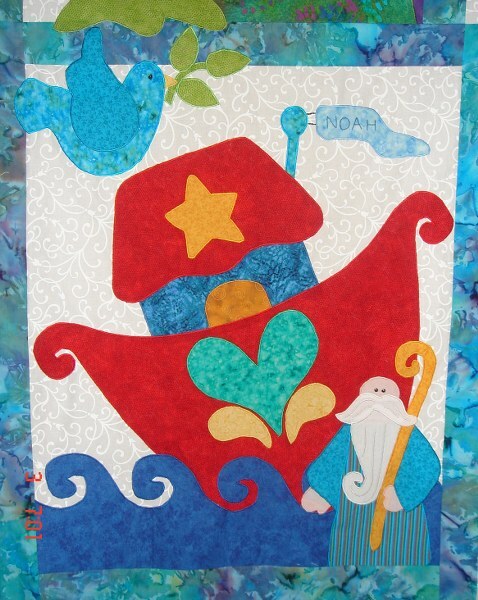 If you want a challenge but not too big a one and with a stunning result try the Kookaburra cottage Noah’s Ark quilt. As you can see the photos were taken when it was still a U.F.O. – actually it still is but I will get round to finishing it soon. It’s just that the quilting isn’t my favourite bit. The Giraffe. Isn't that fabric gorgeous. Hippo, Rhino and Friends. That hippo looks too cheery considering the weight he's carrying. Isn't it lovely. I must finish it. If you are thinking of making this quilt you need to sit down before you look at the pattern price. 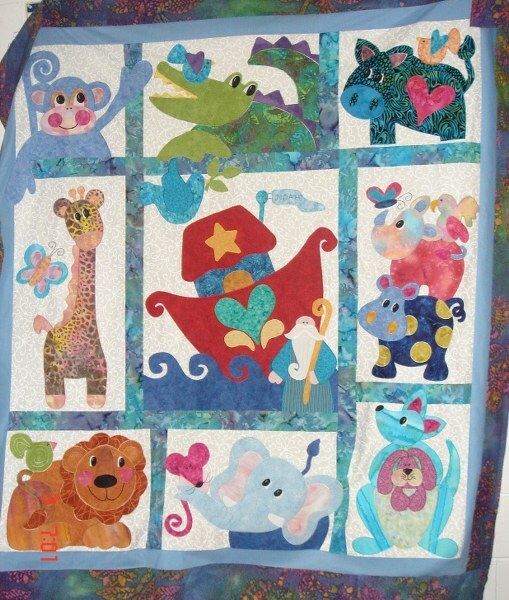 It started as a BOM (Block of the Month see side bar) so each animal is a separate pattern and priced as such . I think it’s worth it but then I’m an addict. If you look carefully you can see it is not difficult although it has the pieces overlapping the edges as in the my other post and also . Happy quilting. I would appreciate some comment if you can spare the time. I have had a couple but I don’t know whether anybody enjoys the blogs or just thinks they are the rantings of a demented mind and steer clear after the first view. Please comment, even rude ones though I hope there aren’t too many of those. Today, Saturday I have been knee deep in cheese again. Not that I actually had to do anything but I still felt part of the process so to speak. I went down to the cheesemaking bit of the cellar to get the watering can as the flowers out front were looking a tad wilted and it looks like a mini dairy. There are not actually any cows there but there are four different cheeses being pressed as we speak. very impressive. 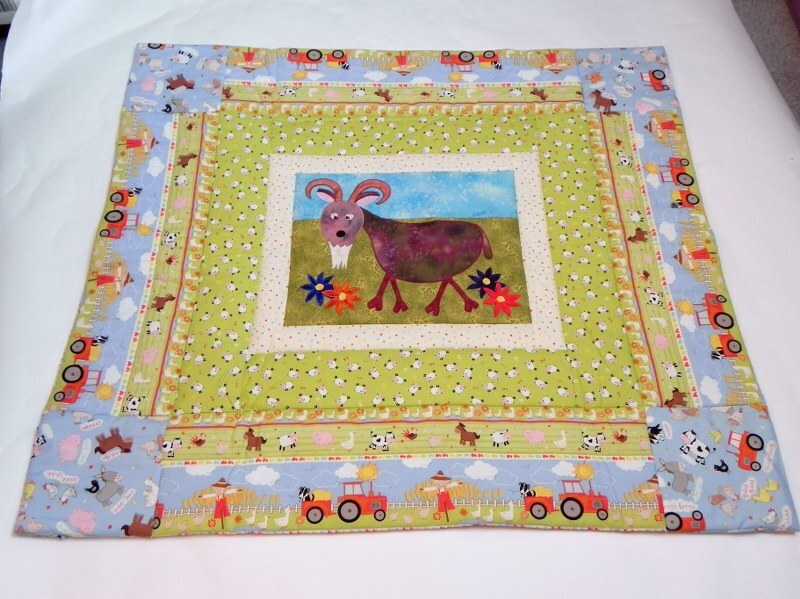 In fact I began to feel quite like a farmer’s wife and it put me in mind of my ‘Funky Farmyard’Quilt design. This evolved from some sketches I made and then I saw the Makower farm fabric and had to have it and the Funky Farmyard was born. Meet Molly the Moo Cow, Horace the Horse, Sadie the Sheep, Denzil the Duck, Ronald and Rabina the Rabbits and Percy the Pig. On his own Gerry the Goat. The pattern has a 6″ border but I just had to use the Makower border fabric which is actually 10″ so the quilt is a very large single and should hang down to the floor on a single bed. 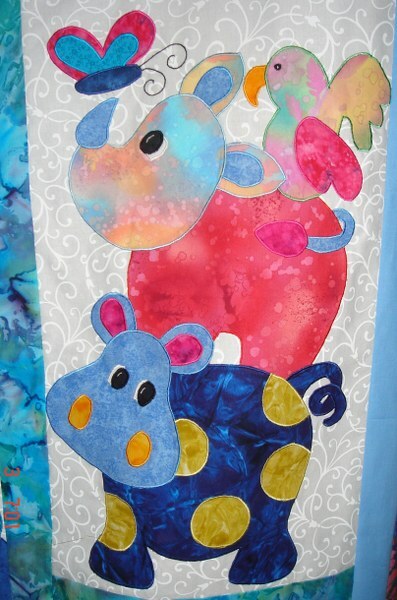 The Goat applique is on a play mat. I think the playmat is a good thing to have around with a baby . If you use a hiloft wadding so that it is soft it makes a very good surface on which to lay the baby when small and also to lay over it when asleep say in the car or on a picnic. In short a very useful bit of katundu. Whilst I was making up the quilt it occured to me that the designs would make good wall hangings too. They could be used to decorate a child’s room in addition to the quilt. They are quick and easy to make and great fun. As you can see you can put on multiple Ducks or just the one and you could put on as many flowers as you like. Using a plain fabric changes the whole look of the design. You could also combine patterned and plain for yet another look. If you would like the pattern or kit go to nsaaquilting.co.uk. If you like the fabric I have some fat quarters in it. At the moment I have kits in Pig, Duck and Rabbit although I could make up one of the others if it appeals. 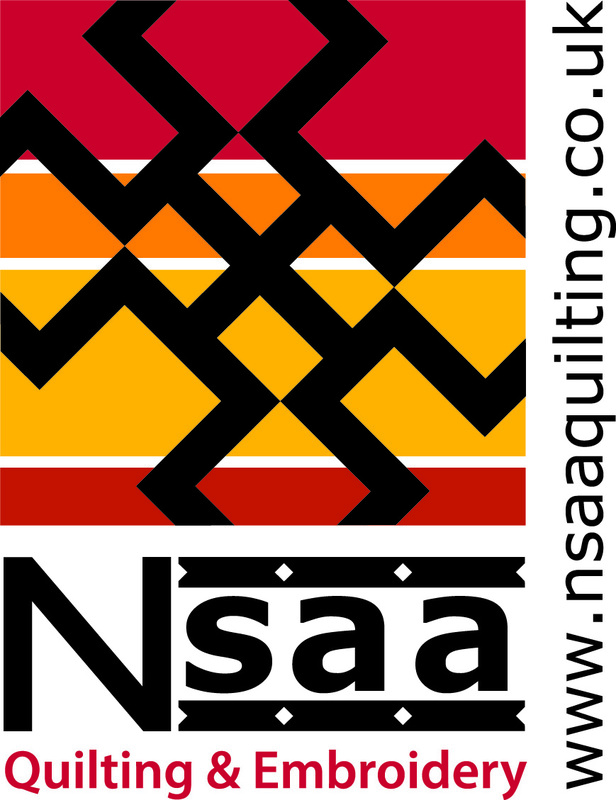 Just email me a info@nsaaquilting.co.uk. I made these in the same way as described in the last post, using a couple of pieces of greaseproof paper and the template. 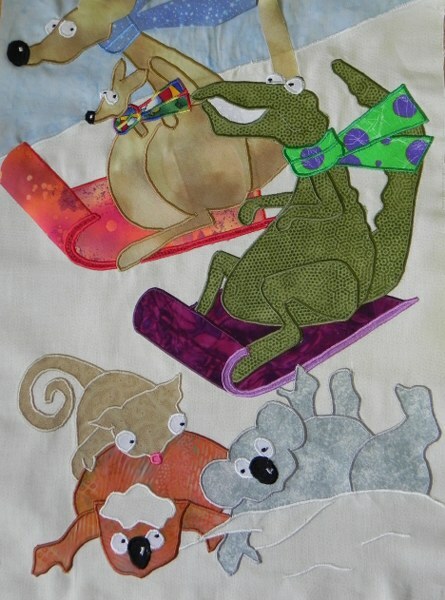 All my applique patterns have reversed pieces so that you don’t have to mess about with a light box. I got quite distressed in sunny countries watching people trying to trace pattern pieces whilst holding the original up to a window. Louvred windows were a particular challenge. You can of course still use a light box to make it easier to trace the pieces onto the fusible webbing but they are the right way round to trace onto the webbing. The use of the lightbox is one of the reasons I only produce single sided patterns. I find it very frustrating to trace pattern pieces over a lightbox with the pieces on the other side showing through. Paper doesn’t cost that much and the printing costs are the same however you look at it. To recap; having traced the reversed pieces onto the fusible webbing and cut round them roughly, I iron them onto the reverse side of the fabric to be used. They are then cut out on the traced lines and the paper backing removed. This leaves a glue surface which allows the pieces, now the right way round, to be placed onto the background fabric and ironed on. This fuses them onto the background and keeps them in place whilst they are stitched. Instead of putting them straight on to the background I make the appliques up first. I lay a piece of baking paper over the template which shows the finished applique. I then place each piece down starting with those that will be underneath and use the point of the iron to tack the pieces in place. When I am satisfied with the result I put another piece of greaseproof over the applique and press quickly, just long enough for them to fuse together. When cool the applique is carefully removed from the greaseproof paper and placed on the background. Using a steam iron it is then fused on. Follow with your choice of stitching. 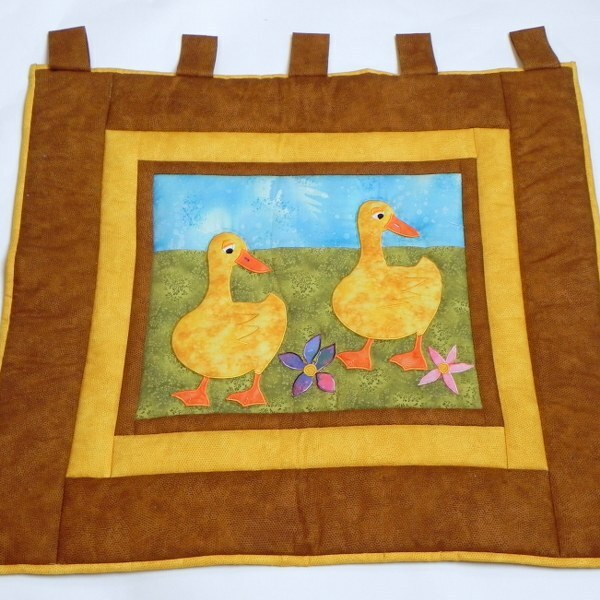 You can use a special applique sheet but I don’t get on with them I prefer the paper. ‘Horses for Courses ‘ as they say. As a finale let me now introduce the Rabbits. I really Like the Rabbits. Put My Horse in There Boy. Sorry about the title it’s something my Dad used to say when he saw a bow- legged cowboy on a film so I couldn’t resist it in a blog about same. 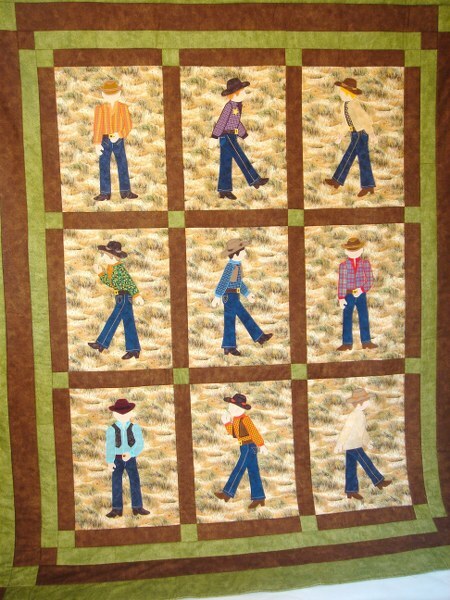 Not that my cowboys are bow-legged, although the beauty of applique is that you can take a pattern and adapt it. If you want bow-legged cowboys knock yourself out as they say. The photo underneath tells you what I am rambling on about. When I started designing these little fellows I got quite carried away. 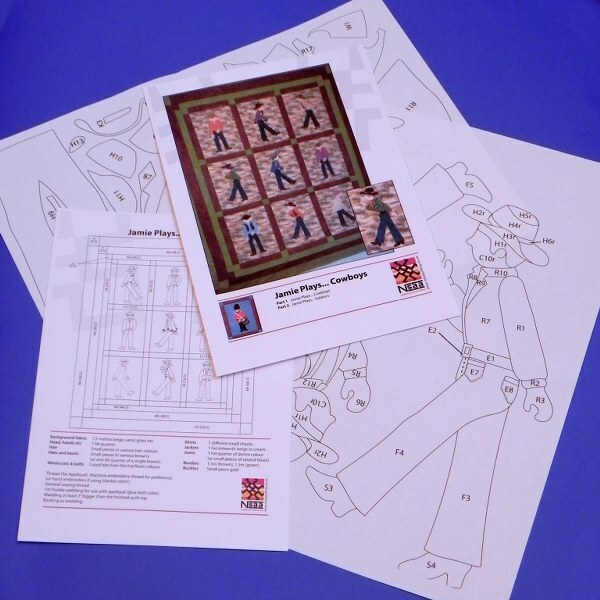 It might look as though this is a very complicated pattern but I have tried to make it as simple as possible by supplying full sized templates on which each figure is preformed ready to go onto the background fabric. See below. With this system a piece of baking paper, or if you are really organised an applique sheet is placed over the pattern and each piece laid down in its rightful place and ‘tacked’ in place with the point of the iron. When the whole figure is complete it is protected by another piece of baking paper, fused with a quick pass of the iron and left to cool. It is then peeled off the baking paper and you have a completed figure to lay down in the correct place on the background. This stops inadvertent bow-legged cowboys but also allows intended changes to the original figure. My skills in applique are largely self taught and I developed this one out of deperation and a sudden ‘light bulb’ moment. There was a time when I spent rather a lot of time placing appliques of shoes on shoe bags prior to stitching them They were not whole shoes but lots of little pieces which had to end up as a whole shoe and at the same time in the right place on the bag. I have lost count of the times I had to move all the little pieces to get it right. I am sure I didn’t invent the process but I suddenly realised that I could put them together before placing them with the judicious use of a piece or two of baking paper or greaseproof paper as we call it here in UK (Not waxed paper). I also discovered a little extra tip the other day when I bought cheap paper as none other was available. If it doesn’t have a nice shiny surface the pieces stick for ever. The same applies if you are dense enough to forget the baking paper and put them straight onto the pattern. Yes I have done that and not only the once either. In my case it didnt matter as I have a printer full of new ones but if you do it on a pattern you have bought it could prove a problem. Having said that, if you ever bought one of my patterns and did this I would happily supply a new sheet. I hate to see people cry and after all I have been there. 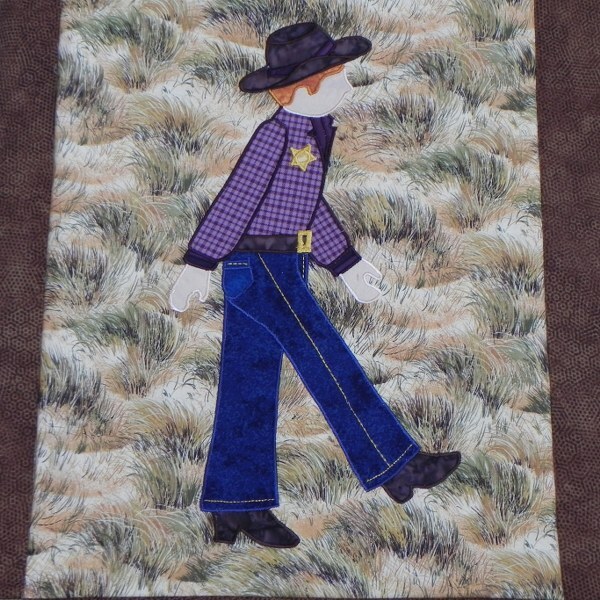 The best bit of a pattern like this is that you can add lots of little extras like the sheriff’s badge and the embroidered fringe on the cowboy top right. 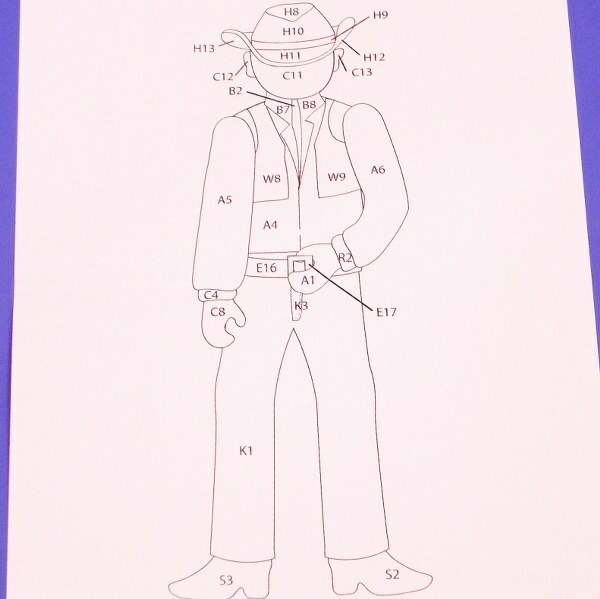 You can also use different shirt fabrics to give each cowboy an individual character. the possibilities are endless. I particularly enjoyed finding the right stitch for the stitching down the legs of the jeans. His Jacket is fringed with stitching. If you would like to see closeups of any of the other cowboys go to nsaaquilting.co.uk or to this link which takes you directly to the page. I am posting this today as I have entered my quilt in a competition at quiltinggallery.com this weekend and if anybody links from that page they can see the quilt detail better. 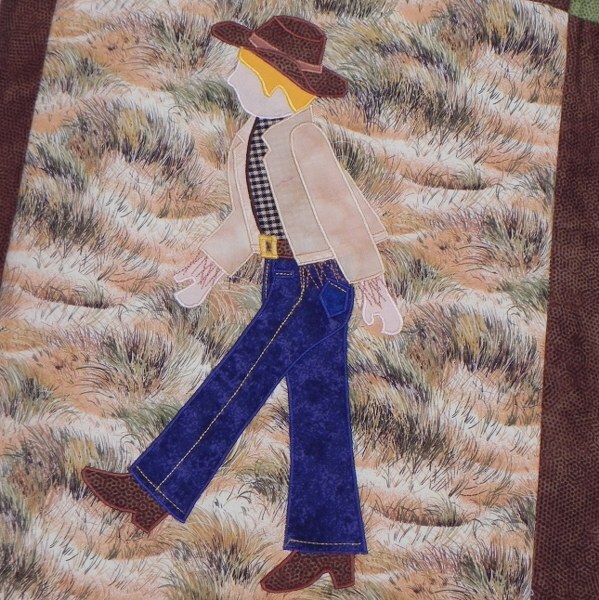 It is a good site to find quilt blogs if you like reading blogs. 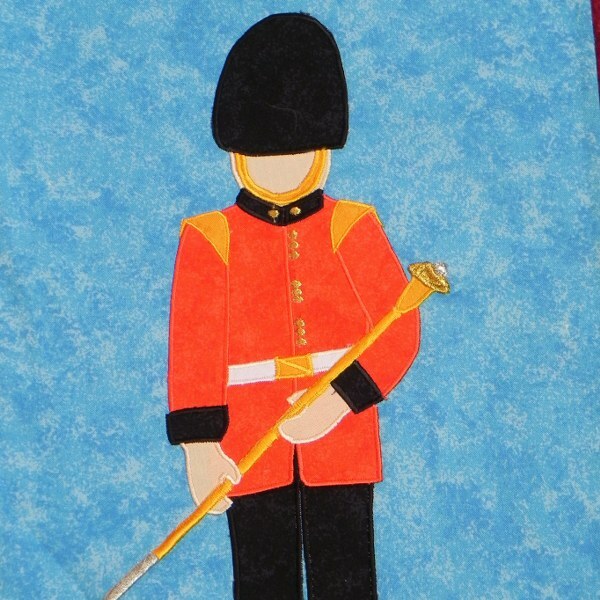 I am rather looking forward to going on later to see the quilts entered as the theme is ‘Boys Quilts’ and there don’t seem to be a lot of them around generally so I would like to see what is. Finally a picture of the pattern content in this particular pattern in case you would like to reproduce it yourself. 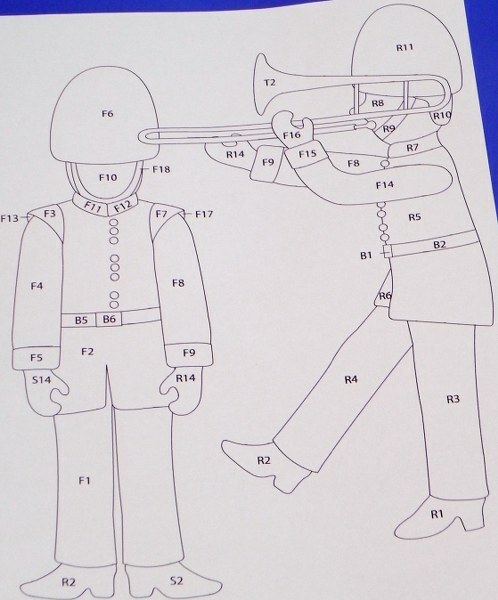 The contents of the cowboy pattern. All 9 templates included. ps. I have just noticed that there are in fact several bow-legged cowboys. Just shows you doesn’t it. As I was taking my constitutional up along the cliffs, I suddenly thought you might like to see what I saw. Today has been the first really lovely day all week and we decided to go for a walk. What I didn’t realise was that we were doing Land’s End to John o’ Groats. At least that’s what it felt like. Mind you I did get treated to an icecream at the three quarter point. That would be gooseberry if you’re interested although I’m not sure why you would be. 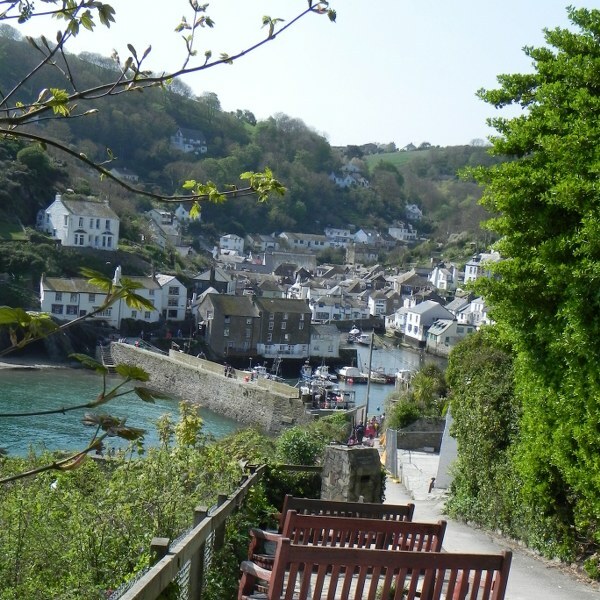 Anyway this is the view as you descend into the village. It was taken before the hoards started to appear so not too populated. 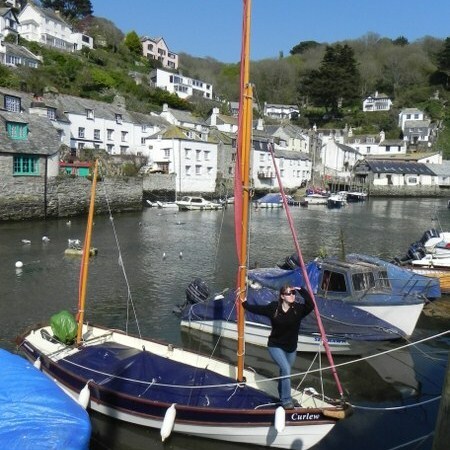 Whilst we are on the subject and bearing in mind the title of this blog let me also show you a picture of the Big Cheese’s boat complete with Daughter number one. I’m not sure if she has the sun in her eyes or is doing the ‘I see no ships’ thing. By the way I am not suggesting that any sailor was even slightly inebriated during the taking of this photograph. It just seemed like a good title for a seasidey blog. You’ll have to excuse the seagulls. As you can see they are not house trained. They ruin everything. I can’t even hang washing out in case they decide to reenact the Battle of Britain and ack- ack the whole lot as they zoom down the line. The noise is worse. They seem to think that if I walk past a window in my own house it is a cue to screech. I have even caught myself reasoning in conversation with a seagull that as the house is mine I am entitled to walk past a window with impunity. I’m not saying they were the exact words but you catch my drift. Anyway, I used to like the sound of seagulls but I hate the little devils with a vengeance now I live amongst them. You would think twenty years would be long enough to get used to it but I’ve got news for you. They also stand in line at the chip shop waiting for someone to drop a chip or lurk outside ready to attack the unwary and pinch a whole fish supper. I saw someone lose a saveloy right before my eyes one evening whilst listening to the fishermen’s Choir. Still the tourists seem to like them and they say if they bomb you from a great height it’s lucky. Well they’d have to say that wouldn’t they. Here’s another view from a different angle. See the big fishing boats. 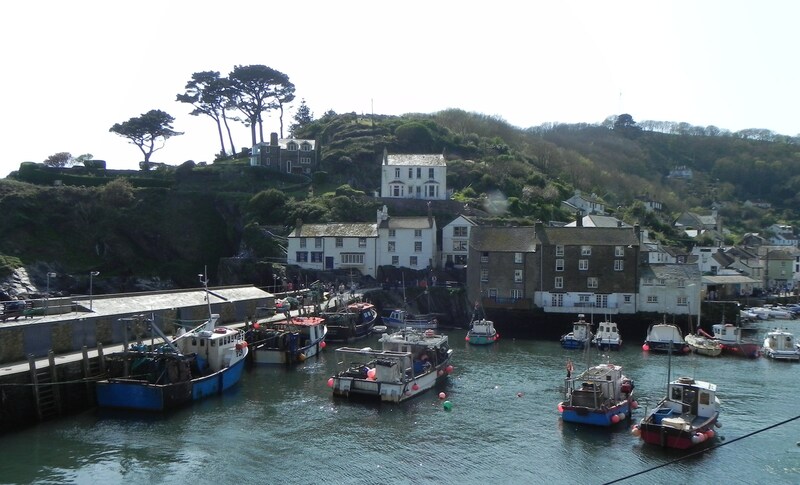 The village is still a working fishing village so boats can be seen going in and out of the harbour when the tide is right. I’ll be back with more on applique in the next few days. Now here’s a turn up for the books. I haven’t done much everyday cooking for years but tonight I have been requested to do so. The Big Cheese says he loves cooking , helps him unwind apparently whereas it winds me up. My hairdresser says that anybody who says they find cooking destresses them, which could be a rough translation of ‘winding down’ is just after an excuse to drink the cooking sherry. Whichever it is it seems to work. Not that the Big Cheese ever seems to get stressed unless you count when he’s talking to me but I think he has a mechanism for that called ‘not listening’. That seems to work too. Anyway, I digress. I suppose I shouldn’t complain as many a quilter has to do the cooking every night. I’m afraid I would have to buy a cookbook of ‘Meals to make when you have just realised it is 10 minutes to dinner time.’ This could consist of a lot of pasta which would in itself have me removed from the kitchen posthaste. He doesn’t like pasta, I prefer not to eat red meat but I am prepared to sacrifice my preferences to my need to be able to get on with more interesting pursuits. I may die early of some horrible disease brought on by rich food but at least I’ll die happy. Not sure what the Big Cheese will do with all the quilt tops I’ve accumulated over the years and never made into quilts but I guess that wont be my problem. You will be pleased to know that the Millamac quilt reported in the post of July 13th is coming along nicely. I have now started the satin stitch. What a lot of pieces were involved in placing though. Still, no pain, no gain as they say. See if you think it was worth it. They cheer me up anyway. This is the one featured in the July 13th post when I had just placed it. Now it is stitched. As you can see there are bits that cannot be stitched yet as they go over the border and will have to completed when the various scenes have been joined with sashing. As said in an earlier post, this is more difficult to do as you have to work with more bulk but makes a more interesting quilt in the end. Finally a view of the perils of the road hog on the slopes. I love this one. The dangers of the 'croc racer'. Anyway, that’s what I am doing at the moment. With a fair wind I am hoping to finish stitching before the weekend . I was going to have to help with the next batch of cheese but daughter number two is bringing her washing home so I’m hoping to do a deal. You will be pleased to hear that my onion tart turned out well by the way. I used some of the Roquefort he made on the cheese course and even if I say it myself it was delicious. It’s not that I can’t cook, just that I can’t see the point. I was helped greatly by the fact that I bought him a Kenwood Chef for his birthday – no really – so I made the pastry, sliced the onions and whisked up the eggs and cream. in the machine. We had a nice little salad and he had a baked potato. I was taught at school that if you have pastry you don’t need a potato. Perhaps boys’ schools had a different philosophy. Or perhaps they did woodwork instead. Whatever, with the example of the head of the household I have never managed to get the idea across to any of my family. Anyway, I am sure you are relieved he didn’t starve.